How growing up in Mandela's South Africa shaped my views on leadership. This year marks exactly 100 years since one of the greatest leaders of our time was born. It’s an important moment for me to reflect on too, because Nelson Mandela was an important man in my own personal history. On Sunday, February 11th 1990 – the day Nelson Mandela was released from prison – I was a young student in Cape Town, South Africa. Together with thousands of fellow South Africans, I lined the streets waiting for his motorcade to pass, driving him to freedom and the city square, where he would address the country for the first time as a free man after 27 years in prison. It was one of the most profound moments of my young life. How could this man, who had been imprisoned for 27 years – he was 71 years old when he was released – speak such humble, kind, courageous words on the day of his release? As the new leader of an emerging democracy, Nelson Mandela was given an almost superhuman task to fulfil: to build a united nation, to empower millions of downtrodden people, to unite the seemingly irreconcilable. It was a momentous era to be part of as a young person. “It is not the mountain we conquer, but ourselves” (Edmond Hillary) – Nelson Mandela conquered a racist system, survived 27 years in jail and still emerged walking the talk of unity, tolerance and hope. He taught me that to become true leaders, we have to face our darkest moments, conquer our deepest fears and rise above ourselves to become the best possible version of ourselves. Be real. Be courageous. Be humble. Nelson Mandela demonstrated the importance of talking about the things that matter. To speak your truth, but speak it kindly. To listen deeply, with an open mind and an open heart, to every opinion – even if they oppose your own. To hold the courage of your convictions, but never to become stoic. Have a bold, inspiring personal vision. 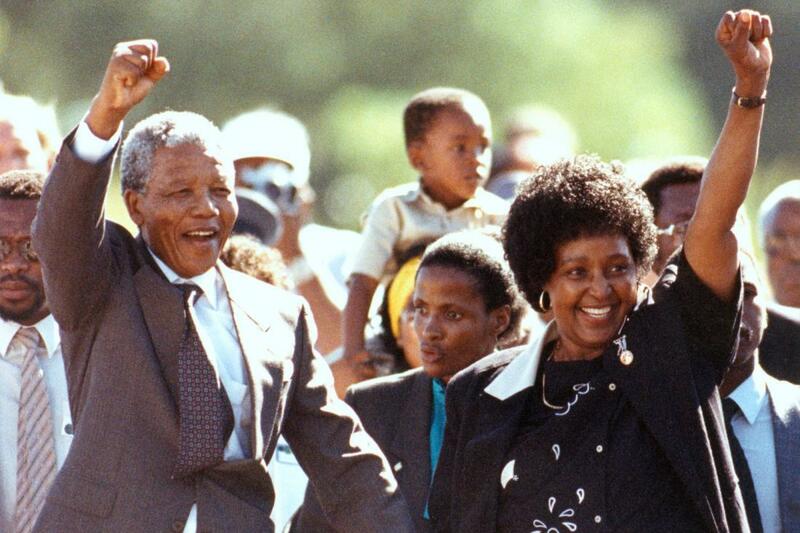 Nelson Mandela had a vision of peace, unity and prosperity: his rainbow nation. It captured the hearts not only of his fellow countrymen, but of the whole world. People will only follow you if you have an inspirational, hopeful, clear vision of their future. Have a vision. Share it. Know your values. Live them. Use all of them to the benefit of the greater good of your people and organization. “I like friends who have independent minds because they tend to make you see problems from all angles.”(Nelson Mandela) – Most leaders are skilled at challenging others, but many are not comfortable by being challenged themselves. Don’t be the leader who rewards me-too thinking. Don’t be the leader who encourages perfectionism or avoids risk taking. Model courage and greatness. Nelson Mandela did and in doing so showed us the power, potential and greatness hidden inside each of us. “A good head and good heart are always a formidable combination.” (Nelson Mandela) – The mind has access to knowledge; the heart to wisdom. Leading with trust, understanding, empathy, forgiveness and love – values that come from the heart, not from the head – are what make a truly great leader. Nelson Mandela deeply understood the formidable power of this combination. To you, Madiba, who set an incomparable leadership example during my youth: thank you for blazing the trail. You showed us all what is possible. My dad used to call me “The Why Kid” because I asked so many questions. I grew up on three continents and went to seven different schools. You could say change is in my blood. Twenty-plus years later, I’m still a firm believer that powerful questions help unlock untapped potential and opportunity. Today I partner with people and organizations in journeys of change. My goal? To help people step into and live from their full potential. To build organizations with strong, healthy cultures that encourage people to use their full potential, that provide a (fun!) environment that sparks innovation and leads to better business. In short: to help people and businesses thrive.